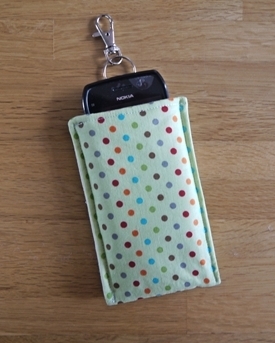 'This' being a padded pouch that perfectly fits an iphone, or indeed anyphone with a standard cover ( a Nokia E6 in this case ). It's a snug fit so the phone won't fall out, and it will prevent it from becoming scratched or damaged. This being the last week of my Summer holidays ( I am a teacher in real life )- the offspring and I spent the morning wandering round the village, and then had a lovely "ladies that lunch" meeting with my good friend H who is currently on maternity leave. 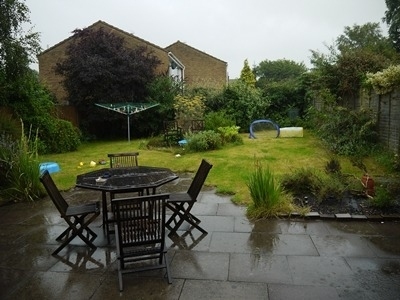 All this activity made the 3 year old very tired and as he retired for a deserved nap, my plans for sorting out the garden were scuppered by heavy rain. 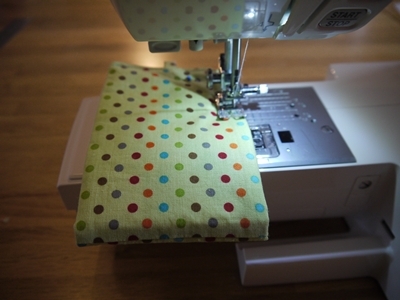 So I thought I would sew a pouch and write an accompanying tutorial. ANYWAY, you came here for the tutorial not to hear me rambling, so here it goes. 2 x wadding ( I chose 2oz polyester ) 5 1/2 x 3 3/4"
Step 1 - pin the outer fabric pieces with right sides facing together ( that is the sides that you will eventually see facing each other ). Sew together at one short side using a narrow seam 0.2" seam - dunno what that is as a fraction. Do the same with the lining fabric. Step 2 - with the right side facing away from you, steam open the seams on the now continuous outer fabric piece. 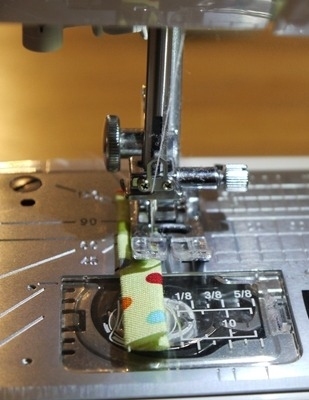 If this is difficult, just iron the seams to one side. Do the same with the lining piece. Step 3 - with the right side facing away from you, iron on the interfacing ( if using ) according to the manufacturers instructions. 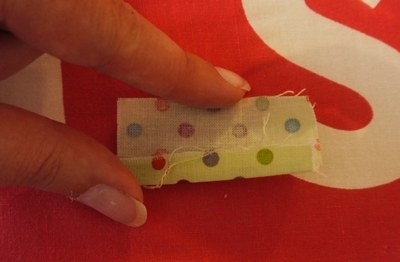 Basically, this means make sure the shiny or knobbly side is facing the fabric, and then iron on with plenty of steam. To avoid creases it is best to use pressing motion rather than an ironing one. Check there are no creases by turning over the piece of fabric and having a look. If there are, try your best to iron them out ( ha ha, see what I did there ?). Do the same with the other side. 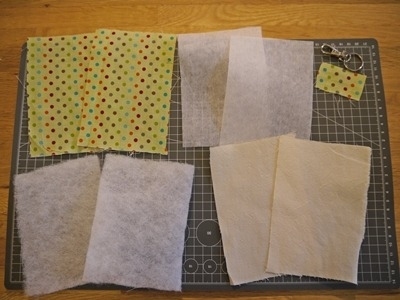 Then fold in half again ( you should now have a four layer piece of fabric ) and press. 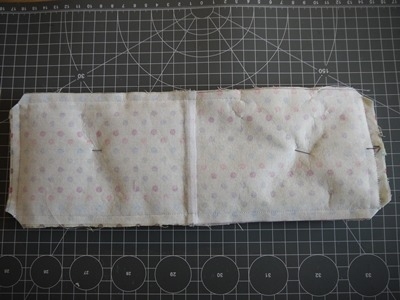 Step 6 - Because it is easier, turn over the sandwich, and sew together one short side, one long side, and one long side leaving a 2 1/2" gap for turning as indicated by the pins in the picture below. Backstitch at the beginnings and ends. 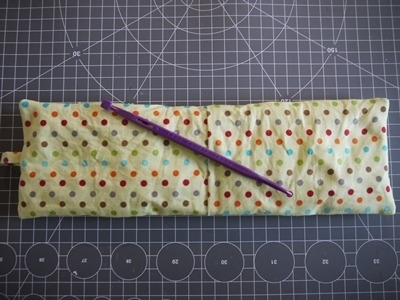 Use a 3/8" seam allowance. Step 7 - Fold your tab in half and insert, with unfinished edges facing outwards, where I have drawn the arrow on the above pic on the right hand short side. This is the middle of that side. Line up with fabric edges. 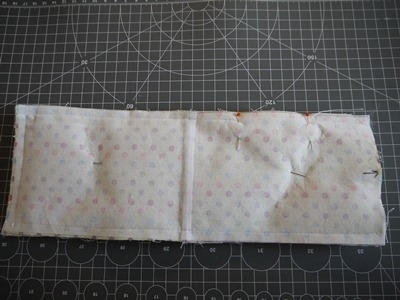 Sew a seam across this side as above. Clip the corners. Step 8 - Remove all pins, as otherwise this could be painful, and turn right side out through the gap you have left, and poke out the corners with a pointy object. I use "that purple thang" which can be purchased for a reasonable £2.95 at U-Handbags. At this point everything will look rather creased and horrible. Fear not ! Step 9 - iron on low 'coz otherwise the fleece will melt, ensuring that you turn in neatly the seam allowances in the gap you left for turning. Hurray, everything will be nice and neat now. Step 10 - Increase your stitch length to 2.4 - 2. 6, top stitch both short sides using a narrow 0.2" seam, backstitching at both ends. Step 11 - (almost there). 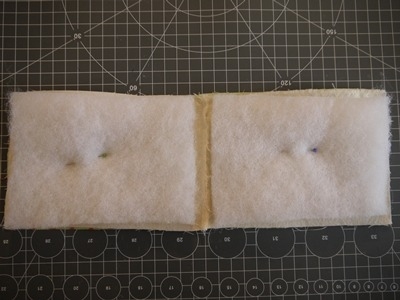 Fold the cover in half, with right sides of outer fabric facing out, pin together as accurately as possible, and then sew up the two long sides using a 0.2" seam, back stitching at the beginning and the end. 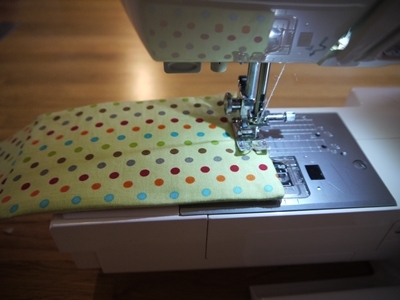 This can be difficult, and you may have to undo a seam if it goes wonky and start again. This too has happened to me. Step 12 - attach your keyring and lobster swivel clasp, and you are finished. Time for that G&T :). 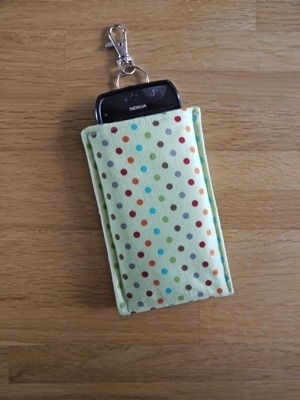 I hope you enjoy making this phone pouch and would love to see pics :). Comments are also welcome, even if it is just to inform me of an unclear step or error. Please only use this pattern/tutorial to make pouches for your personal use and not for commercial gain, as it took time and effort to come up with both. If you do wish to make reference to this tutorial, please link to it here on my website. Finally, if you have read the tutorial, but don't fancy giving it a go, come and buy a pouch in my shop !